PYPO will be offering THREE levels of Camps this summer! Click on the tabs above to view the details about each camp. For developing level String, Woodwind, Brass, and Percussionists in their 2nd or 3rd year of playing. For intermediate level Strings, Woodwind, Brass, and Percussionists in their 4th+ year of playing. For advanced High School level camp for students with 5+ years experience. Level: Developing String students and Band students in their 2nd and 3rd year of playing. The Overture Strings Camp and Overture Band Camp is designed for string or wind, brass and percussion players who can read music and are in their 2nd or 3rd year of playing. 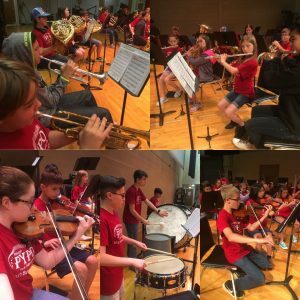 Two ensemble allows students to learn more about instrument technique and ensemble playing while working in a string orchestra or band setting. Students play classical, traditional and contemporary music. Students will also have recreational and musical games as part of their camp experience. Rehearsals: 9:00 A.M. to 3:30 P.M. 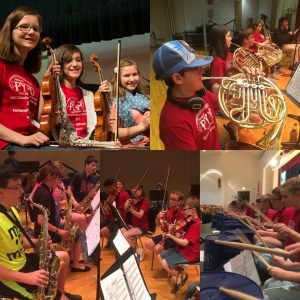 The Prelude Ensemble Camp allows musicians whose skills are still maturing to gain experience with their string, wind, brass, or percussion instruments and to work on more challenging music, techniques and orchestral skills. This camp is designed for students who are in their 3rd year of in-struction or higher. Rehearsals are in held in string or band ensembles as well as full orchestra. The PYPO Full Orchestra Camp is our most advanced camp, demanding exceptional technical facility and music reading ability. The literature is challenging material requiring independent playing. -High School Strings and Percussion- no audition required. -Woodwinds and Brass players who are not part of PYPO, will need to submit a video recording of your playing for acceptance into this camp.